It is system specially designed to monitor all the jobs relating to you packaging. All the people working on your packaging are constantly in contact through their computers. FORLABELS, always focused on innovation and the constant improvement of the services it offers, has taken a significant step that makes its cooperation with its customers even better. With the WEBDONE system for the management of digital files, the company provides to its customers electronic access to the mock-up of their packaging so that they can make changes or comments at any stage before the final approval and printing. Providing each customer with a unique code, it allows them at any moment access to the various works saved in the system and to the various versions of the same work. This way, the customers of FORLABELS, or the graphic designers they are working with, can follow the mock-ups saved in the system, make corrections, and communicate their comments in writing, having all their communication concentrated in one field and not spread out in several emails. More specifically, the WEBDONE management system allows them to check the colour separations, the size (dimensions) and to indicate changes in the text or the artwork in real time. And above all, access involves high resolution files, without the need for special programs, and to make things even easier, access is also possible through a mobile phone or tablet. The proper management of your files is crucial when it comes to: minimising production times, which helps us always have available space on the shelves; and minimising errors which translates into saving time and money. 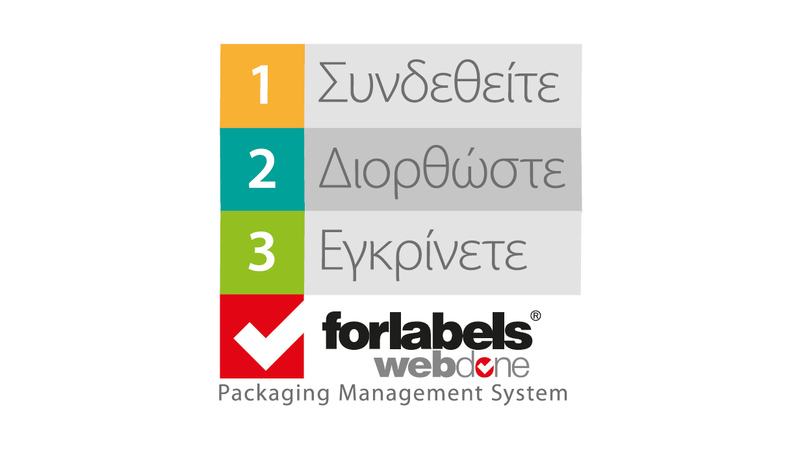 The WEBDONE management system reduces the time normally required for file management, minimises possible mistakes, improves communication and cooperation between FORLABELS and its customers, and most of all ensure excellent quality for your packaging.